The pace of change in technology is extraordinarily fast and, it seems, only getting faster. Ideas and technology that seemed to belong to the realm of science fiction are now very much on the cusp of becoming commercial realities. It is against this exciting backdrop that the latest edition of the CSE Quarterly is launching. 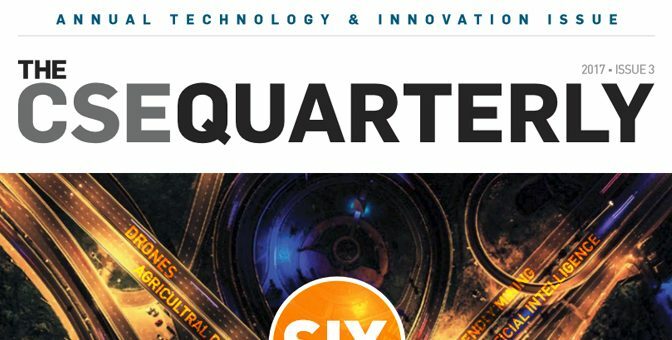 The growing constituency of tech issuers on the CSE, including those profiled in this edition of the CSE Quarterly, provide great examples of innovators leveraging technology to solve real-world problems and have global impact. Read the latest issue of the CSE Quarterly below. Previous PostPeering into the next big thing in tech: Preview of the Extraordinary Future ConferenceNext PostAre You Protected Against Cyber Security Attacks?